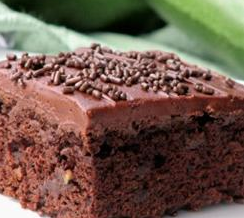 You must make these moist delicious brownies to rid yourself of some zucchini and indulge in some chocolate!! New favorite recipe of ours! !” ~Terrie G.
Preheat oven to 350 degrees. Grease and flour a 9 x 13 inch baking pan. In a large bowl, mix together the oil, sugar, and 2 tsp. vanilla until well blended. Combine the flour, 1/2 cup cocoa, baking soda and salt; stir into the sugar mixture. Fold in the zucchini and walnuts. Spread evenly into the prepared pan. Bake for 25-30 minutes in the preheated oven, until brownies spring back when gently touched. Frosting: Melt together the 6 Tbsp of cocoa and margarine. Set aside to cool. In a medium bowl, blend together the powdered sugar, milk and 1/2 tsp vanilla. Stir in the cocoa mixture. Spread over cooled brownies before cutting into squares. Adapted by a recipe from Allrecipes.